This is the post in which I act as if I know what I'm talking about. I've been asked several times what sort of feet or tools I use to do certain things when I sew. In the process of thinking of how to answer, I've been struck by a recurring theme: people often think that you need special equipment in order to do things. Or, putting it another way, if you don't have Tool XYZ, you can't do piping, or ribbing, or invisible zippers, or whatever. Coates will have you believe that you need an invisible zipper foot for inserting invisible zippers. I use my normal zipper foot. 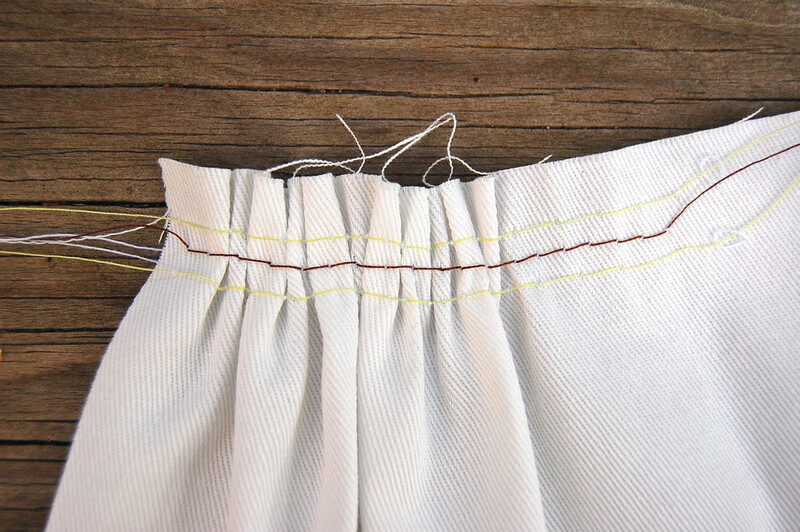 When I lay my zipper tape along the sewing line, I machine-sew a line of long stitches (basting stitches) at the edge of the zipper tape, far away from the coils, to hold the tape in place. Then I use the normal zipper foot, hug the coils so they open up, and sew. When I'm done, I pull out the long basting stitches or I leave them in if they're hidden in the garment lining. Incidentally, invisible zippers are very easy to insert. Easier than regular zippers, in fact - I never need to hand-baste in an invisible zipper, but I always do regular zippers. I don't have a piping foot. I use my zipper foot. Again, I sew a line of basting stitches at the edge of the piping tape to hold it in position before I hug the piping cord with the zipper foot. I don't have a bias binding foot. I've thought of buying one, but after asking around, I got the impression that it did not significantly improve the ease or the result of sewing with it. So I just sew bias tape the usual way - with a regular presser foot and hand-basting. Sergers are all the rage now. I own one, and I like having and using it. Sometimes certain fabrics make the loops come out like worms. So then I hate it. I've only had my serger for 4 years. All these past decades of sewing, I've used the zig-zag stitch on my sewing machine and I've been perfectly happy with it. In fact, there are times now when I deliberately choose a zig-zag edge finish over a serged finish, simply because the serger can't get into tight curves the same way a sewing machine can. So if you have a serger, good for you. If you don't, and feel you want one because you want to branch into professional sewing, that's good too. But if you don't own one but feel you're missing out, don't. It's not the fancy tools that make the seamstress. People in the old days were outstanding seamstresses and they used treadle or hand-crank machines. Or sewed by hand. I don't own an applique foot. Although at one point in my life, I was convinced that I needed one to do "nice applique". I've unbrainwashed myself now. I use a regular presser foot and a close zig-zag stitch. And I turn the fabric a lot. I don't own a pleating foot. I measure my pleats, pin them, and sew straight across to hold them in place. If they are tiny pleats, I use my seam ripper. Is there a gathering foot? I dunno. I use the longest stitch on my sewing machine and do TWO rows (about a quarter inch apart) - one on either side of the actual sewing line. Then I pull to evenly gather to size. Then I sew ON the actual sewing line, between the two rows of gathered stitches, which fixes the gathers in place. Then you pull out the rows of gathering stitches so they don't appear in the finished garment. Here is what I mean - the green stitches are the gathering stitches, and the brown stitches are the actual sewing line. The gathers are awful and irregular and hideous, but they would have been worse if I had sewed only one row of green stitches. Note: This is just one of many methods of gathering. 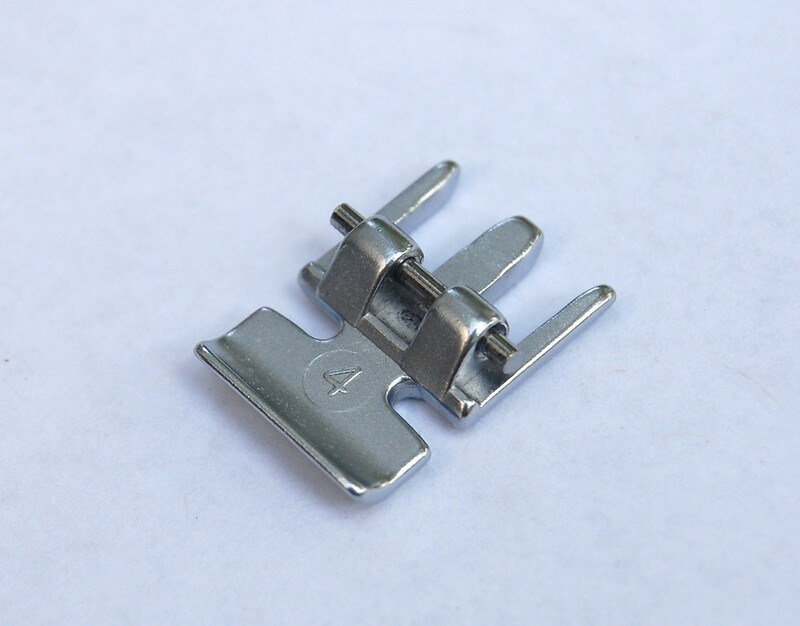 You can use differential tension in your sewing machine (top tension different from bottom tension) to gather fabric too. I must try that someday. I use a ball-point needle for knits and stretchy stuff. It isn't sharp like a regular needle so it doesn't catch the fabric. I do use elastic thread for shirring. Otherwise I don't use any special stitches or feet or thread when I sew regular stitches on knits. If I am sewing necklines that need to stretch to go over heads, I stretch the ribbing (cut smaller than the neckline) to fit the neckline; I don't stretch the neckline. Same for fold-over elastic: I stretch the elastic (cut smaller than the waist) to fit the waist. Pull both ends of the ribbing/elastic - both behind and in front of the presser foot as you sew, unless you have a walking foot, which does the behind-pulling for you. My only suggestion is to invest in a walking foot, if you can, and if your sewing machine doesn't have it built in. It holds fabric layers so nicely together so they don't pucker or slide as they go under the presser foot. It isn't only for quilting (which I never do). I use it when I make many-layered thick-fabric bags, work with elastic and slippery fabrics and zippers. 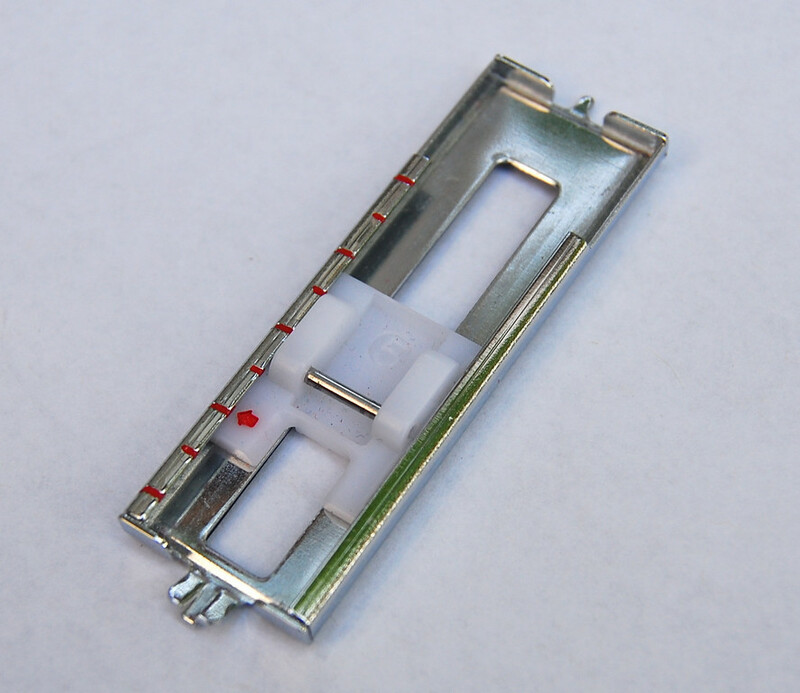 My walking foot is built into my sewing machine shank system, so I can engage it together with whichever foot I'm using - the zipper foot, for instance. Obviously, it is a good thing if you already own fancy feet and enjoy using them. 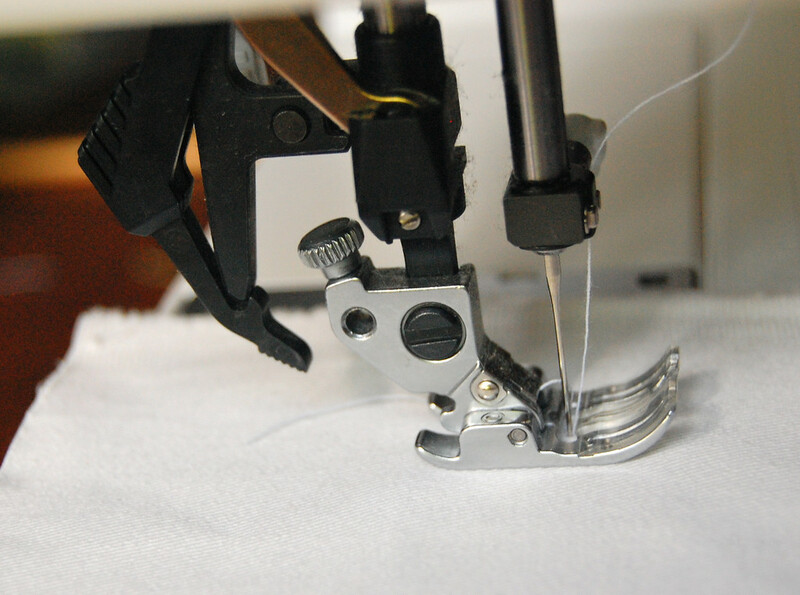 That's what they were created for - to simplify or facilitate specific sewing tasks. 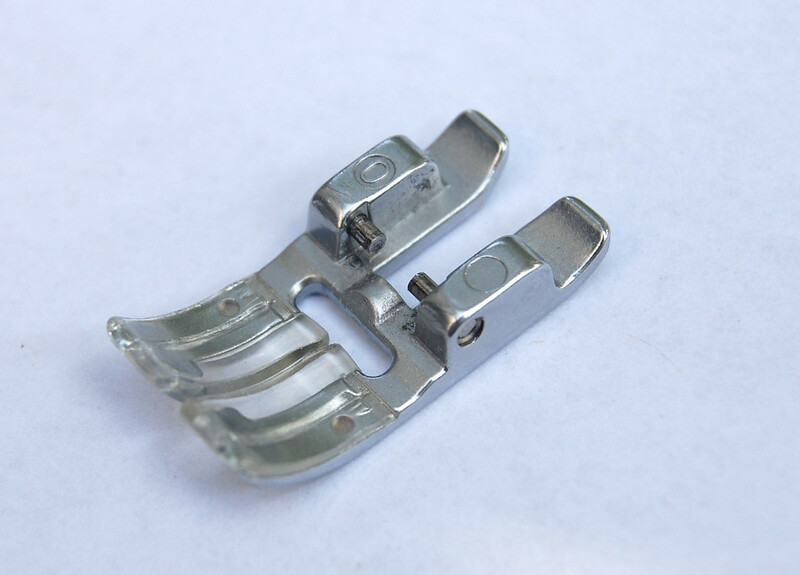 I've been tempted to buy a couple fancy feet myself but always laziness or the relative difficulty of getting clip-on Pfaff feet (without going on ebay or to my dealer) has indefinitely postponed our happy meeting. 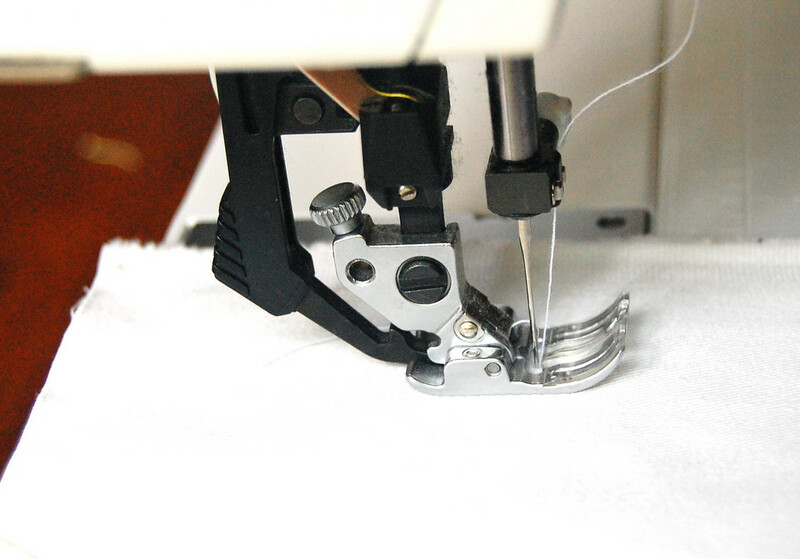 Sometimes sewers who have just bought their first machine, or are just beginning to sew can be overwhelmed by all the gizmos that promise to turn them into better seamstresses. Perhaps after reading this you might be a little bit more confident that you can do a whole lot of stuff without fancy feet. 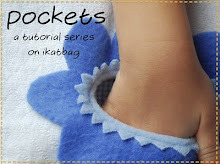 What tips do you have for sewing without fancy feet? Thanks so much for the info. I good way of looking at it. lar foot a lot, the buttonholer, and the zipper one, as you do. Recently, I started using more the narrow hemmer and a foot for stitching in the ditch... and then I found a 1930 Singer at a garage sale, with a little box full of feet, to gather, bias-binding, hemmer... so now I'm experimenting ! All that for $12. Not bad. I agree! I'm not very long in sewing experience, so maybe that's why I keep doing things without the "proper" tools. I also like your advice about a serger too. I want to sew some knits and I have the Home Stretch book by Wendy, so I just need to do it. I do quilt with my walking foot, but I also use it for anything with layers. Got mine on ebay. I gather with a way my friend taught me: sew a large zig zag over a loose thread, then at the end, pull on the thread to make the gathers. Good way to use up random, old spools of thread, too! I use only my regular foot and my zipper foot, but then I'm too busy plunging ahead with projects to stop and figure out how to use another foot. But then I'm a non-gadget and make-do person, so sheesh! All the hand-basting! I hardly pin my poor zippers. When I bought my vintage Elna Supermatic from 1953 (or so) it came with so many feet I couldn't identify. There was even a darning foot! Not that I know how to use it. It even is made to use two needles! So I think I might be able to serge with it, but I need to figure out how... 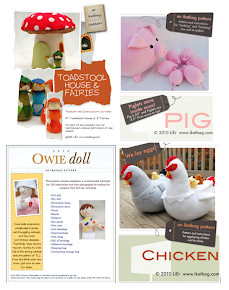 Your blog is one of my favorite resources in advancing my sewing skills past "sew forward" and "turn, then sew forward again". Thanks for all your really useful information!